We have an excellent business relationship with The Cave Architecture and Design, Alderley Edge, Cheshire. 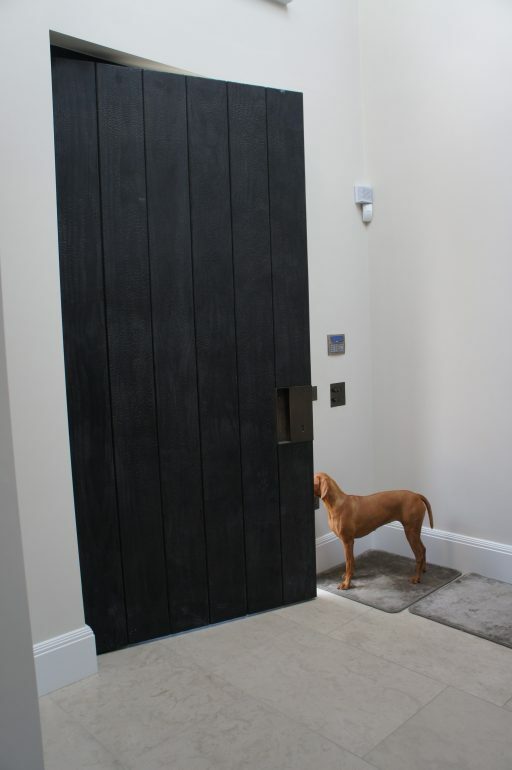 So, when asked by them if we could supply and install a Shou Sugi Ban front door, a pair of automated gates and four garage doors for a prestigious development in Cheshire, we were delighted to be given the opportunity. The Cave had been let down by another supplier having decided it too risky an undertaking. 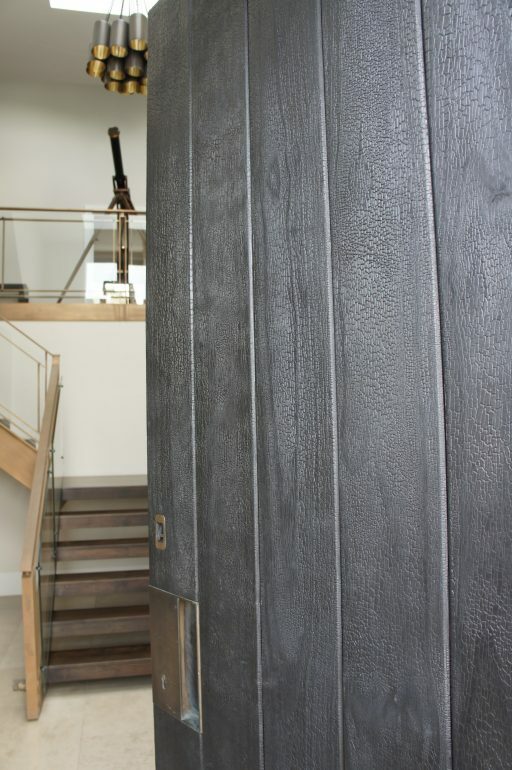 The client was requesting Shou Sugi Ban treated timber, the traditional Japanese method of preserving and finishing wood. 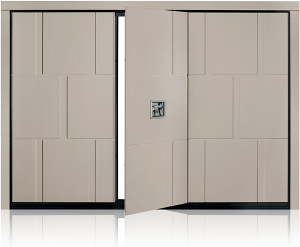 We would normally look to Silvelox, for products of this nature, but they were unable to supply us with a door of this material, nor any of the other luxury front door manufacturers. Therefore; to fulfil this request we were going to have to manufacture them ourselves. The Shou Sugi Ban front door was going to be a special challenge. Once we had the Shou Sugi Ban timber, the gates would not be a problem for us. We have been manufacturing gates for many years in all the different materials. We approached timber importers who supply the Shou Sugi Ban timber. This presented us with an immediate problem. The dimensions of the timber available to us was limited and unsuitable. 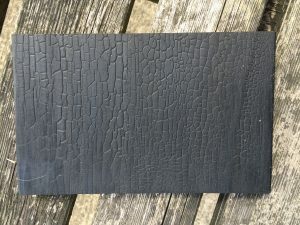 We therefore decided to experiment with producing our own Shou Sugi Ban finish. We settled on Accoya as the timber for the entire door construction and the boards to be used on the gates. Accoya is a very stable and durable engineered timber. It was reasoned that this timber would not only be rot resistant but also not twist and warp when undergoing the torching process. The scorching with the industrial blowtorch proved successful. 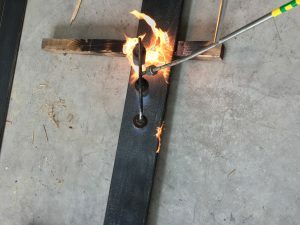 A technique was found to achieve a beautiful uniform finish of the charring. The charcoal surface was then sealed to prevent soiling of anything touching it. 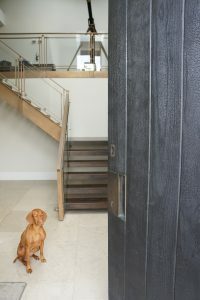 A sample piece of the Shou Sugi Ban timber was then shown to the clients who were delighted with the result. Accoya is a dense, heavy timber. The overall size of the door and the thickness would result in it being very heavy. The size was not a problem, but the door was going to need a very solid frame and special hinges to support the weight. Accoya would be used for the timber frame. To ensure that this door casing did not move, a galvanised steel sub frame was made to give a solid fixing onto the inner course of blockwork. This steel frame would be later plastered over. 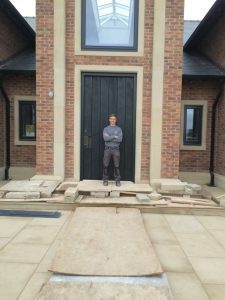 James Darnell, the Managing Director of Lakes Doors, had taken charge of the entire project. He redesigned the handle after it was realised that it would require the door to be too thick. The door thickness was now down to 90mm. A local fabricator made the handle in stainless steel. It was then bronze coated along with the bezel on the fingerprint reader. 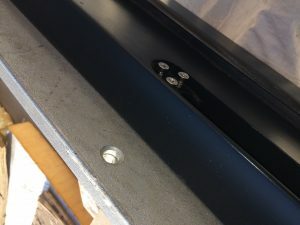 The hinges we used were Simonswerk Tectus. Each hinge being able to support a massive 300kg. The electric multi point locking was GU Secury with key operation in case of a power cut. The biometric fingerprint reader was supplied by Sommer. James also realised that it was a fairly simple matter to fit a radio receiver in the door so that the Clients could open the door with a keyfob transmitter. We checked with them and they agreed that this was indeed something that they would also like. 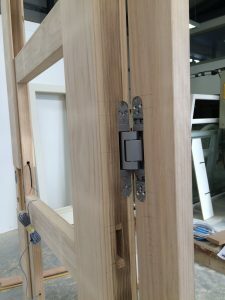 The internal frame of the door leaf was constructed in the workshop and temporarily hung in the frame. The inner frame was prewired for the electric locking mechanism. Insulating the door cavities was also carried out at this point. Our carpenters fixed the outer boards and completed all the machining and hand carpentry. Great care was then taken with the final torching and scorching to produce the beautiful Shou Sugi Ban finish. The whole door was then treated with the sealant to protect the finish. Everything was ready. The door was complete, had been tested in the frame and the Site Manager had given the green light for us to install the door. We decided to fit the door on a weekend when the site was quiet and we would have a clear run. On the day, our fitters quickly had the steel and timber door frames levelled and fixed in place. It then took four strong men to manoeuvre the door into place. The hinges were fitted into the prepared recesses in the door and then into the frame. The door swung beautifully and fitted perfectly. It closed with a very soft thump and opened with a swish as the frame draught seals released. A temporary power supply quickly established that the locking worked efficiently. The four automatic bolts engaged deeply into the door frame mechanically on closing and released electrically when triggered. 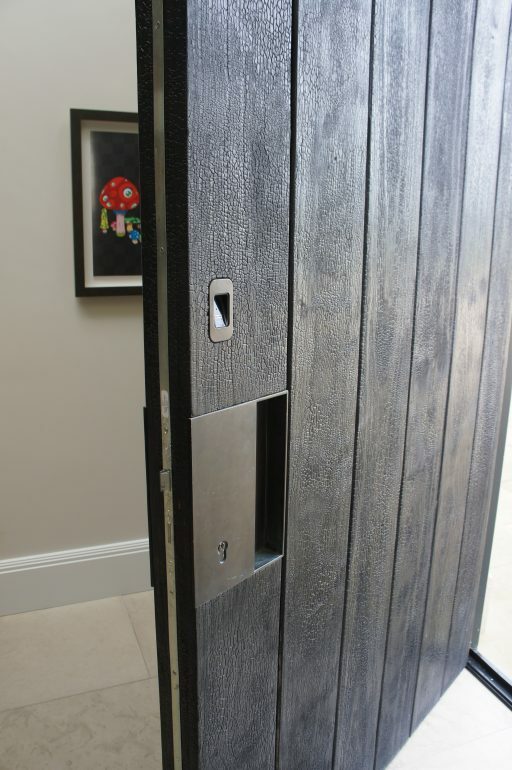 Finally, all that was left to do was commissioning and handover of the Shou Sugi Ban front door to the Clients. This took place when the remainder of the house was completed and we had a permanent electricity supply to the front door. This door is totally unique being completely bespoke. It may be the only one of its type in the Country. We are justifiably proud of our achievement in producing this door and once again gaining customer satisfaction.